AXA, a French global insurance companies group, has come out with a television commercial designed to promote stable financial services in an world of economic instability. The savings account, I-Plus Welcome, is presented as the safe option in a time of deep uncertainty, demonstrated with sets and characters thrown out of balance by shifting points of gravity. The spot begins with the vulnerable egg, rolling off a shelf. Continuing in the home environment, dining room tables and beds slide across the floor. 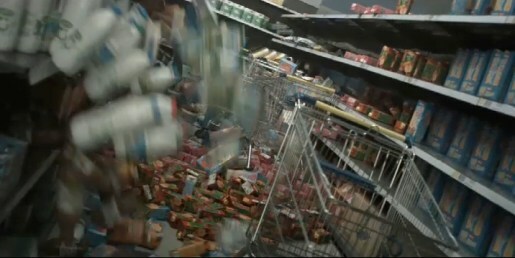 In the supermarket items fall of the shelves while trolleys crash all over the place. A trapeze artist swings from an apartment window. Out on the street pedestrians, furniture and cars appear out of control. Originally promoting the IPlus account in French and Dutch, this English version, minus voiceover, has the super: “AXA – a stable bank in an unstable financial world”, over a gloomy cityscape. The Unstable World ad was developed at Duval Guillaume, Antwerp, by creative directors Geoffrey Hantson, Dirk Domen, art director Thierry Wiebking, copywriter Henry Scott, agency producers Marc Van Buggenhout and Bruno Dejonghe. Filming was shot by Koen Mortier via Czar with director of photography Nicolas Karakatsanis and producer Sophie Casse. Koen Mortier is also represented by Quad in France. See the making-of video hosted on Vimeo by King Emperor.